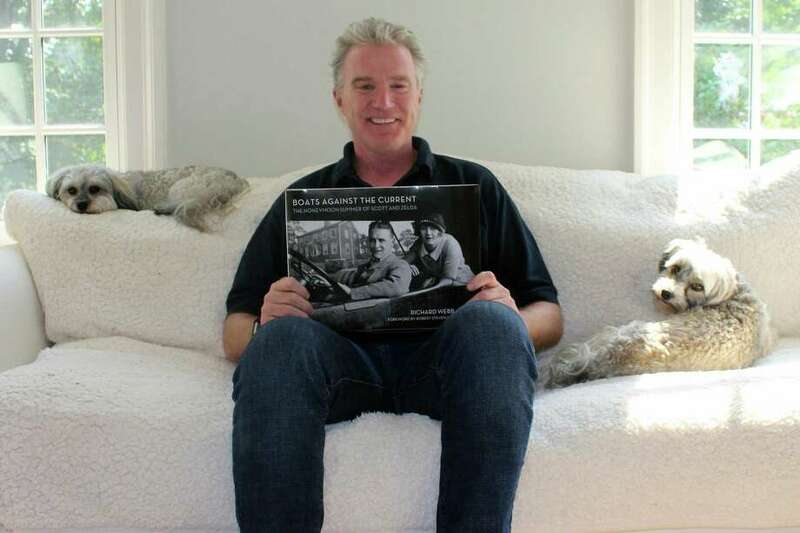 WESTPORT — A lifelong Westport resident, Richard Webb has spent the past five years chasing the history of two former residents, F. Scott and Zelda Fitzgerald. As a kid growing up near Compo Beach, Webb, 56, who goes by the nickname “Deej,” frequently rode his bike past 244 Compo Beach Road South, where the couple summered in 1920, and when he was 14, Webb read Fitzgerald for the first time. While reading “The Beautiful and Damned,” Webb was struck by the fictional town’s similarities to Westport. “I’m reading paragraph upon paragraph of the road map of the town. It was otherworldly,” Webb said, noting that the geography in which the characters in “Damned” traveled mirrored the roads in and around the South Compo Road neighborhood. Most of the principal characters in Fitzgerald’s short stories and novels are young men, so reading Fitzgerald’s work as a young man himself was powerful, Webb said. For years, however, Webb allowed the inkling that “Damned” and Gatsby were set in Westport to wallow. Following his graduation from Staples High School in 1980, Webb went on to Vanderbilt University in Nashville, Tenn., where he studied European and American history. In his post-grad years, Webb worked in Nashville for Broadcast Music Inc., then returned to Westport in 1988 to run George H.W. Bush’s presidential campaign in Fairfield County. In the early 1990s, he sold voice-mail systems for a telephone company. While in his early 30s, Webb decided he wanted to enter teaching, which became his fourth and longest-running career. For the past 24 years, Webb has taught U.S. and global history at New Canaan High School. Around the same time Webb began teaching, the writer Barbara Probst Solomon published an article in the New Yorker, arguing “The Great Gatsby” was set in Westport, and not Great Neck, N.Y., as was commonly thought. Probst Solomon knew something about Westport because she grew up in town on a large estate, now home to the Saugatuck Yacht Club, which lay across the Sound from the 175-acre estate of a mysterious millionaire and the relatively small house on the corner of the estate where the Fitzgeralds lived that summer of 1920. The dock on Probst Solomon’s property was the longest in the vicinity and had a green light on it. “With Fitzgerald partying at a mystery millionaire’s house and looking over across the Sound, she postulated the green light was the light of her dock,” Webb said of Probst Solomon’s New Yorker article and connection between the green light in “Gatsby” and her home. “The article died with little fanfare” because Probst Solomon’s theory didn’t fit with writings of the academic Matthew J. Bruccoli, the “god of Fitzgerald scholarship,” who claimed “Gatsby” was set in Great Neck, Webb said. Probst Solomon gained a supporter in Webb, however. “Reading that article, she put it all together — landmarks, geographic weight-points,” Webb said. He put together a PowerPoint presentation about the theory to show his students and share with whoever would listen. Five years ago, Webb presented the Fitzgerald in Westport theory at the Westport Historical Society and connected with fellow Westport resident Robert Steven Williams, a filmmaker who proposed the pair pursue the idea. Webb’s research on the Fitzgeralds has culminated in a coffee-table book, “Boats Against the Current: The Honeymoon Summer of Scott and Zelda: Westport, Connecticut, 1920,” to be released on Amazon on Tuesday, June 26, with a companion documentary, to be aired on Connecticut Public Television this fall, put together by Williams on Webb’s research. In presentations over the years, Webb said he asked Fitzgerald enthusiasts to challenge his ideas, but most simply became adherents to his ideas. “Low and behold, everybody jumped on board. It was really quite extraordinary,” Webb said of the supporters, including academics, Fitzgerald’s granddaughter and the Great Neck Historical Society director. Aside from the geographical similarities between Fitzgerald’s stories and Westport, Webb said the Fitzgeralds meticulously cataloged their five months in Westport in their scrapbooks, while they barely wrote about the year and a half they spent in Great Neck. As to why Westport meant so much to the Fitzgeralds, and arguably set the scene for “Gatsby” and several of Fitzgerald’s other stories, Webb said it was because the Fitzgeralds landed in Westport five weeks after their wedding, in the honeymoon period of their relationship, before the heavier years of mental illness, alcoholism and death overcame the couple. “They could remember this time clearly. It was a happy and productive time for both of them, while it was utter chaos for them in Great Neck,” Webb said. Webb said he spent the past five years chasing the Fitzgeralds’ history in Westport, and Westport’s influence on Fitzgerald’s work, primarily because, “it’s really cool,” but also to revive a forgotten element of Westport’s artistic history. “These are incredibly important American books. ‘Gatsby’ is the American novel of the 20th century, hands down. The fact that it happened here, and nobody was celebrating it, that just couldn’t go on,” Webb said.